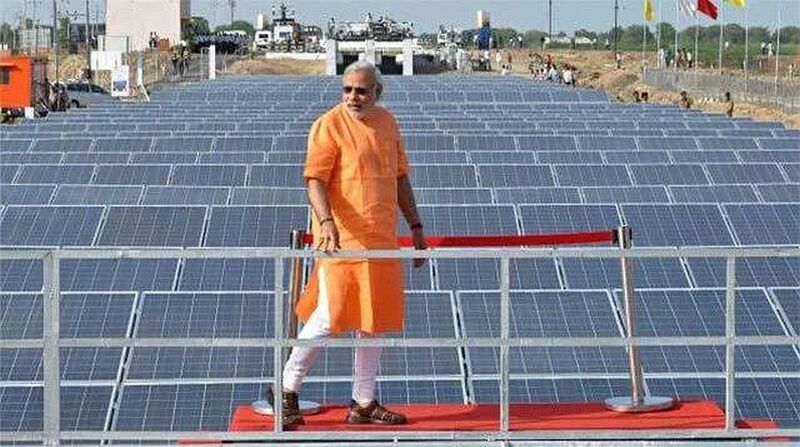 Prime Minister Narendra Modi has called for setting up some model solar cities where power requirement is fulfilled solely by solar energy, an official statement said on Tuesday. Modi, who on Monday reviewed progress of key infrastructure sectors including petroleum and natural gas, power, renewable energy and housing, also called for greater emphasis on ethanol blending, said a PMO release on Tuesday, adding that the review meeting came soon after the review of connectivity-related infrastructure sectors in the last week of April. "The Prime Minister called for establishment of some model solar cities, where the power requirement is fulfilled solely by solar energy," it said. Modi said a similar effort can be made to make certain localities kerosene-free. He said manufacturing of solar equipment should be given priority to boost employment generation and derive maximum benefit from the renewable energy drive. Seeking a consolidated approach to various schemes, such as electrification, IT networks and housing, he called for a focused approach on the 100 worst performing districts in each case. He directed that future reviews should focus on problems at the district-level, so that the progress of poorly performing districts can be better monitored. The release said that Pradhan Mantri Ujjwala Yojana has benefited 1.98 crore below poverty line households so far, while contribution of gas to the primary energy mix has risen to eight percent with 81 cities being covered under City Gas Distribution networks. Laying greater emphasis on ethanol blending, Modi said that setting up of second generation bio-ethanol refineries should be expedited to utilise agricultural residues. The release said that rural electrification programme was on the track for targeted completion and over 13,000 of the 18,452 identified villages had been electrified. It said over 22 lakh rural BPL households were electrified in 2016-17 and over 40 crore LED bulbs were distributed in the same period. The total inter-regional transmission capacity has been significantly enhanced, with 41 GW transmission capacity being added from May 2014 to April 2017. The release said that total renewable generation capacity has crossed 57 GW, with an increase of 24.5 percent being registered in the last fiscal year. The capacity addition in solar energy in the last fiscal was the highest-ever, at 81 percent. Solar and wind tariffs have now achieved grid parity with rates well below Rs 4 per Kilowatt-Hour, the release said. Under Pradhan Mantri Awaas Yojana, over 32 lakh houses have been completed in rural areas in the last fiscal. Modi enquired about the training and skills being given to rural masons, who were involved with this scheme.